Whoever pulled this rabbit out of a hat taught it a few spells of its own. Fun fact: its left ear and right ear each fire off their own magic! 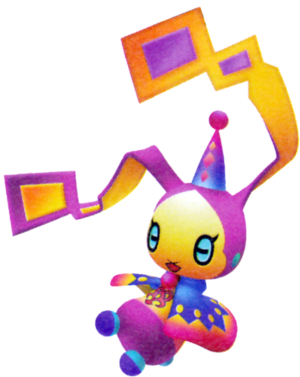 The Majik Lapin is a type of Dream Eater that appears in Kingdom Hearts 3D: Dream Drop Distance. The Majik Lapin's name and design reference the rabbit (Fra: "Lapin"), and the hat-trick, a magic routine in which the magician pulls a rabbit from a seemingly empty hat. ↑ 1.0 1.1 Becomes available when in Accomplice disposition. ↑ 2.0 2.1 Becomes available when in Illusionist disposition. The Majik Lapin Recipe may be purchased from the Medal Shop of Flick Rush in the Fourth District of Traverse Town. The Majik Lapin can be created through eight different recipes. The fourth recipe is a rank B recipe that has a 30% chance of transforming from Me Me Bunny. The fifth recipe is a rank B recipe that has a 40% chance of transforming from Peepsta Hoo. 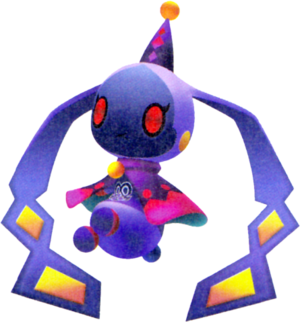 The sixth recipe is a rank B recipe that has a 40% chance of transforming from Ghostabocky. The seventh recipe is a rank A recipe. The eighth recipe is a rank A recipe that has a 60% chance of success. This page was last edited on 31 March 2019, at 11:08.